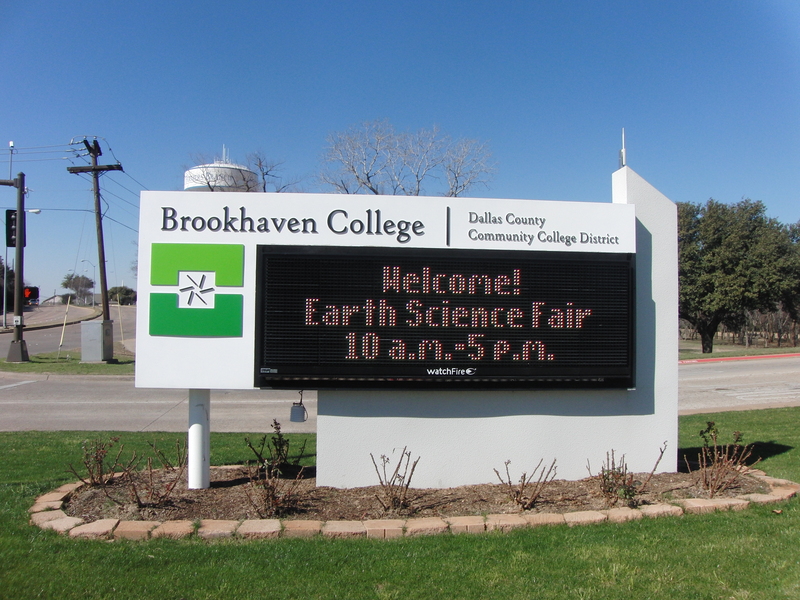 Brookhaven College in Farmer’s Branch held an Earth Science Fair, and we were excited to get to attend! 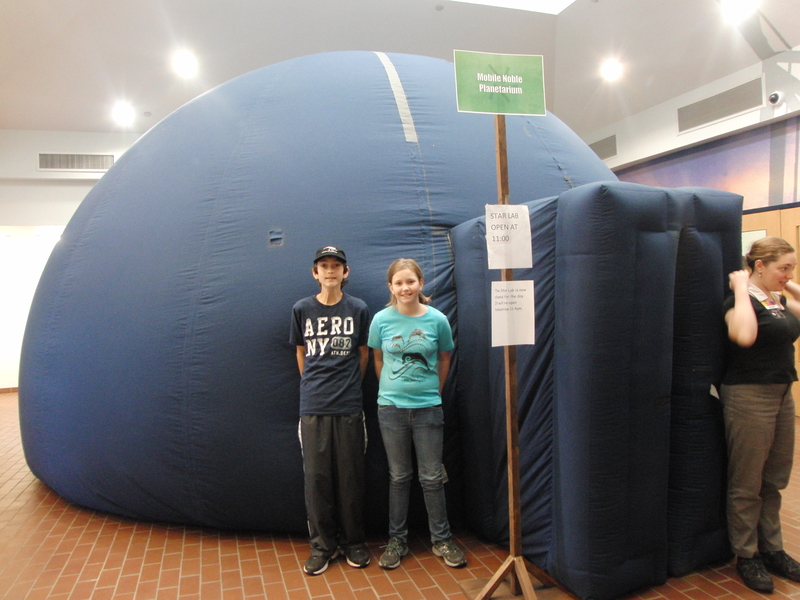 Our first stop was the inflatable planetarium! Have you ever been inside one of these? In the pitch black interior, we learned about the constellations and our night skies! We left outer space, and journeyed to inner space on our next stop. The Petroleum Engineering display took up an entire room, as geologist helped visitors make “Slime“, a borax and glue solution, with sand. The Slime was meant to simulate the sand and water used in “fracking” by the gas companies during drilling to release natural gas. Displays showed us the depths of the wells, and explained horizontal drilling, which we found interesting since there is a well about 1/4 of a mile from our house! 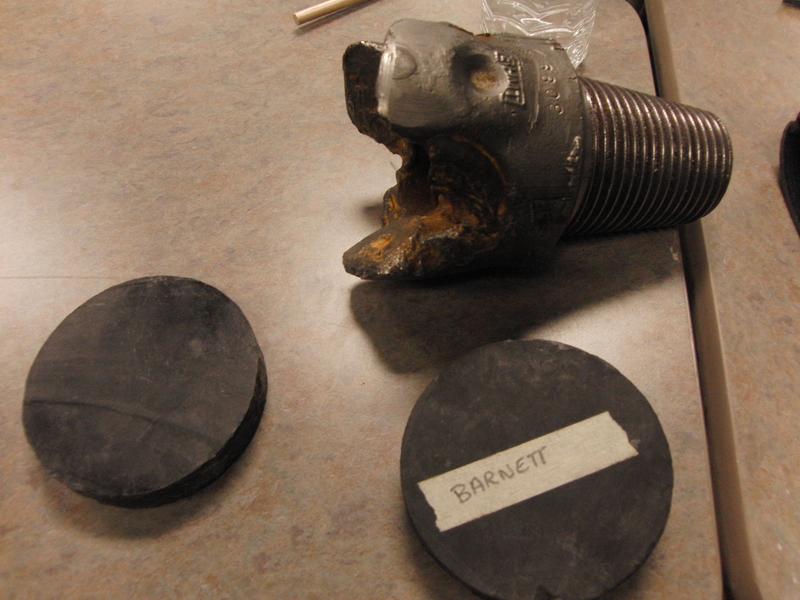 Pictured above are slabs of Barnett Shale, where the gas is being found, and a drill bit. To read more about this, Click Here for one of the best sites I’ve found in explaining it. Two huge rooms were filled with exhibits from the college, and also local museums and earth science clubs! For geeks like us, it was Disney World! 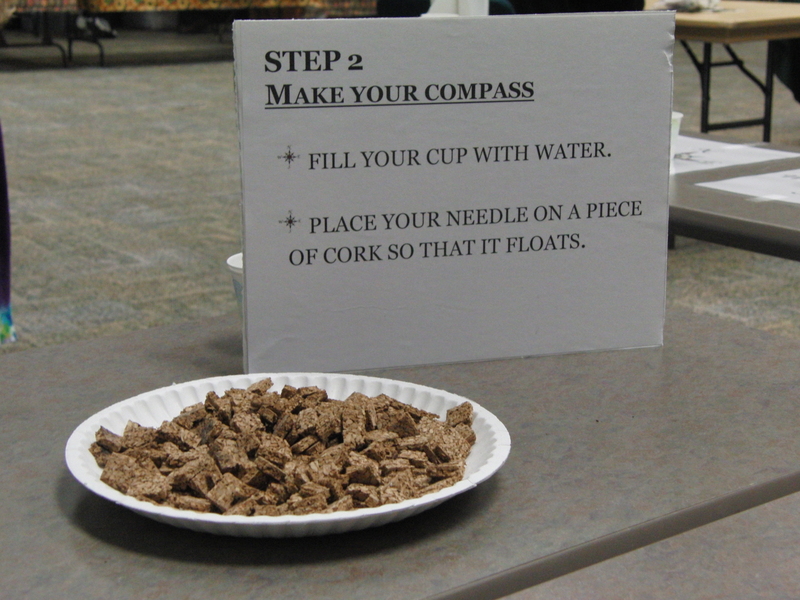 My daughter made a compass using cork, needle and water. Click here for directions on how to make your own! 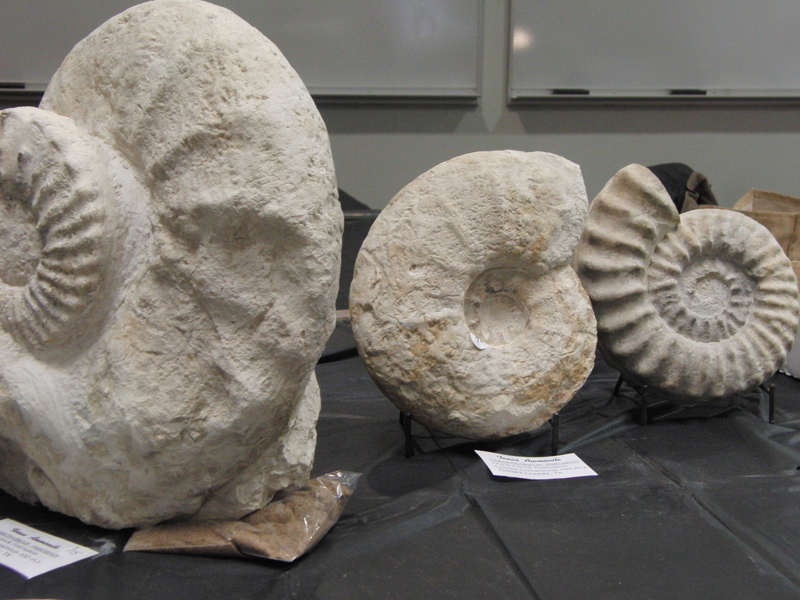 Ammonites found in Texas, fossils left over from when much of North and Central Texas were covered by a shallow sea. While many local museums, such as the new Perot Museum and the Heard Museum had displays, so did many local fossil and rock hunters, who were onsite to sell some of their finds! The Heard Museum, located in McKinney, brought out several displays, and a rattlesnake that they had acquired from Texas Parks and Wildlife. 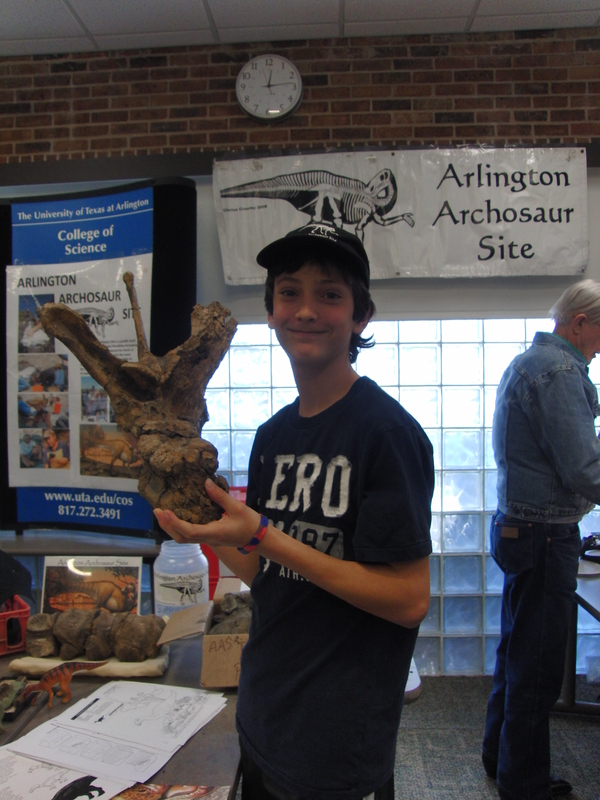 The highlight for my son was the Arlington Archosaur Site’s display! Here he is holding a real (not a cast) dinosaur bone found at the site in North Arlington. Visit their website, and learn about the dinosaurs, ancient crocodiles and turtles they are uncovering! 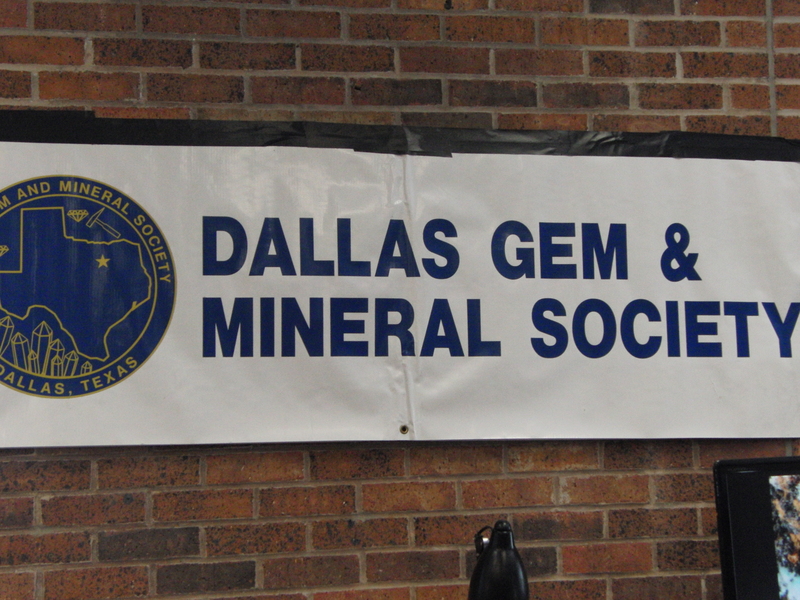 I’m a real rockhound, so I was excited to see that the Dallas Gem and Mineral Society had a display at the event as well! They brought out with them selections of rocks, and even polishers. Volunteers were demonstrating how ordinary looking rocks can be turned into beautiful jewelry. We played a fossil identification game, too! Do you know what this is? 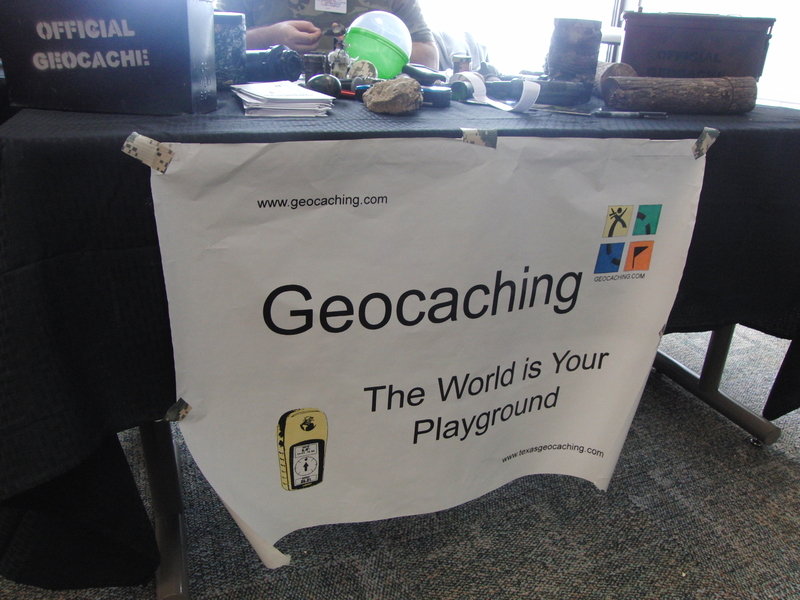 Have you ever Geocached? It’s a fun outdoor activity for everyone, and they also had a booth at the fair. Visit www.geocaching.com for more information! 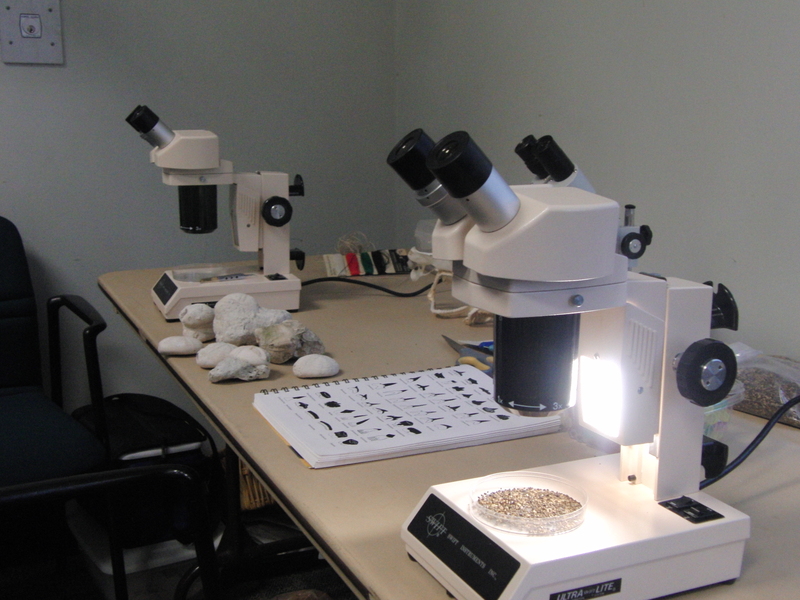 Displays with microscopes helped visitors identify rocks, minerals and even fossils! 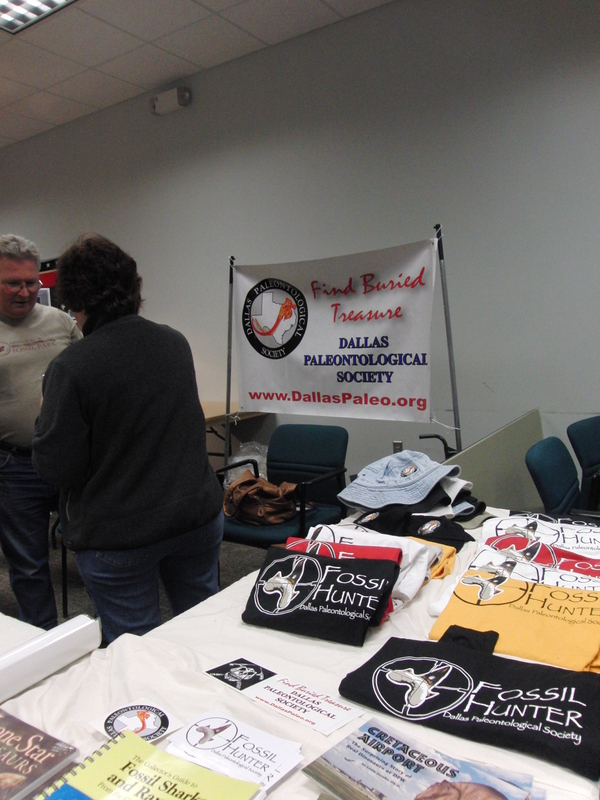 The Dallas Paleontological Society offers amateur fossil hunters a chance to get together with others, learn more about them and go on field trips. I hope some of these fun displays from the Fair inspires you to get out and join a local club, or go out on an adventure of your own! 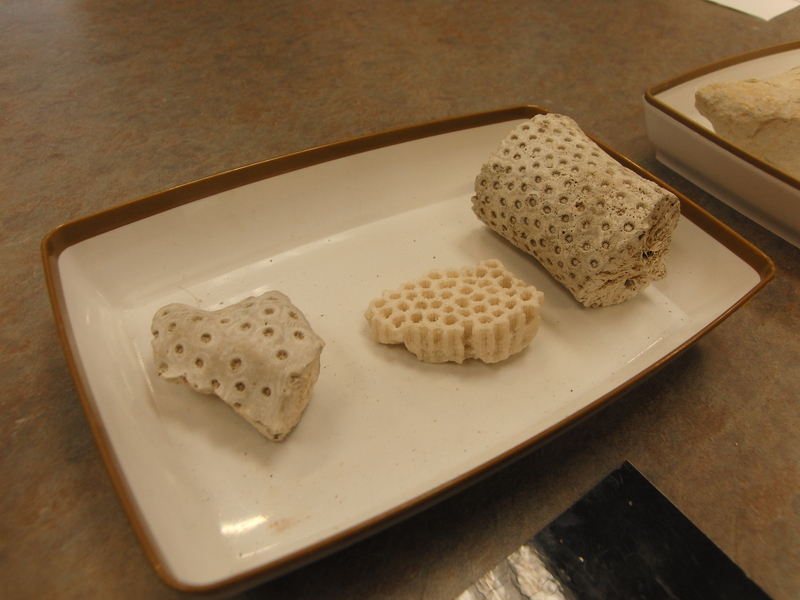 To read about one of our favorite fossil parks, click here!